US official says airstrike on Damascus targeted several Hezbollah leaders, as well as Iranian ammunition supply points. Several leaders of the Hezbollah terrorist group were targeted in Tuesday night’s airstrike on the Syrian capital of Damascus, which Syrian media blamed on Israel, Newsweek reports. The information was given to Newsweek from a Department of Defense source with access to the information. The airstrike was conducted minutes after the leaders boarded a plane bound for Iran, according to the report. 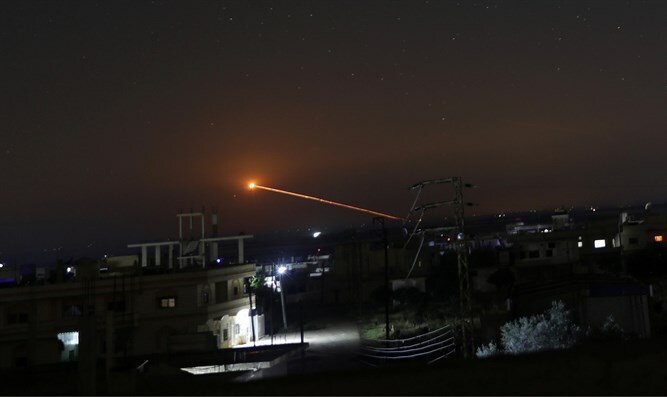 The IDF stated on Tuesday night that an Israeli anti-missile system was operated against an anti-aircraft missile launched from Syria. In late November, Syria accused Israel of carrying out air strikes on Kisweh, south of Damascus. The air strikes reportedly targeted warehouses and headquarters of the Iranian militias in the area. Israel did not comment on those reports either. “We are continuing with a firm hand to prevent Iran’s military buildup in Syria. We are about to complete the dismantling of the tunnels in which Hezbollah has invested so much, just as we are about to end the disarming of tunnels in which Hamas has invested so much,” Netanyahu said.